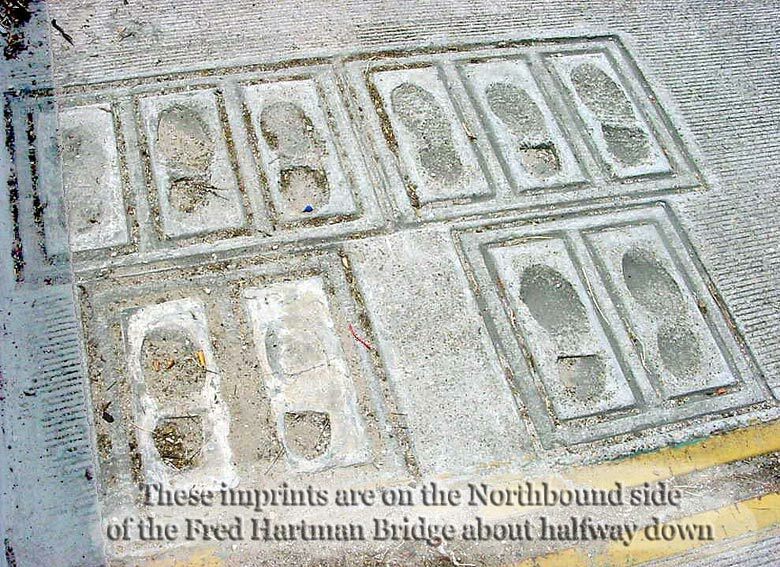 Fred Hartman Bridge footsteps explained! were placed by Williams Brothers employees who poured concrete for the bridge deck. They poured a record 1 million square feet of concrete for this bridge deck. The Fred Hartman Bridge or Baytown Bridge is a cable-stayed bridge in the U.S. state of Texas. It spans the Houston Ship Channel and carries State Highway 146 between the cities of Baytown, Texas and La Porte, Texas. The bridge, named for Fred Hartman (1908-1991), the editor and publisher of the Baytown Sun from 1950 to 1974, is the longest cable-stayed bridge in Texas, and one of only two such bridges in the state (the other being the Veterans Memorial Bridge in Orange County, TX). Construction cost of the bridge was $117,500,000. The bridge replaced the Baytown Tunnel (of depth clearance 40 feet (12.2 m) which had to be removed when the Houston Ship Channel was deepened to 45 feet (13.7 m), with a minimum 530 feet (161.5 m) bottom width, to accommodate larger ships. The last section of the Baytown Tunnel was removed September 14, 1999 from the Houston Ship Channel, with removal of the tunnel being the responsibility of the Texas Department of Transportation.